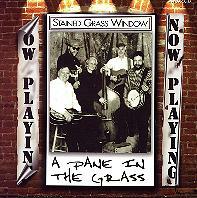 Liner Notes for Stained Grass Window's "A Pane in the Grass"
No musical genre can stay "pure" for very long, not the least of which that great American art form bluegrass. There are traditionalists who insist that the style must be played a certain way, and there are artists who start with acoustic instrumentation and boldly go where no banjo has gone before. Stained Grass Window manages to elude ready categorization: playing some traditional tunes but not afraid to venture into unexpected material. Further setting them apart is the strong presence of a harmonica in the otherwise classic instrumental lineup. This Pennsylvania- and New Jersey-based quintet had its start in 1994 and has quickly been attracting attention in the region, performing at major venues such as the Wind Gap, Wise Owl, Canyon Country, and Peaceful Valley Bluegrass Festivals, along with arts festivals in State College, Wilkes-Barre and Lewisburg, PA. I first had a chance to work with SGW a couple of years ago when they first appeared on the Homegrown Music regional-artist series I produce for Public Radio. The group's distinctive instrumentation, eclecticism and commitment to their music impressed me greatly. In the interim, SGW has been further honing their craft, becoming an ever tighter ensemble, and raising their already high level of musicianship. Like many of the best groups, Stained Grass Window is more than the sum of its parts, with the combination of the members' diverse credentials being one of its great strengths. Lou Eberlin, guitarist and vocalist, came from a country background, being a more recent convert to bluegrass. In addition to his solid rhythm guitar and classic tenor vocals, Eberlin also added some lyrics to two of the new songs appearing on Pain in the Grass, written by the group's friend, guitarist John Doan. Mary Hermann, acoustic bassist, brings to SGW a long-time love of traditional folk music, as well as a background that also includes playing guitar and fiddle. She provides the bottom end of the instrumentation and the top end of the vocals. Ken Shafranko, who supplies the impressive Dobro work to the group, claims he hated bluegrass as a kid, but was somehow won over in his college days. He calls Mike Auldridge his resophonic guitar hero, and also brings a vocal background in church and theater music. Mark Doncheski, banjo and mandolin, is the member with probably the longest tenure in bluegrass bands, playing bass with Dark Hollow for a number of years. His tasteful picking and versatility, along with his contributions to the group's arrangements are a strong presence in SGW. Bob Meehan, whose harmonica work is a Stained Grass Window trademark, comes with diverse background. A New York native, now residing in New Jersey, he has performed for over two decades in rock, blues, Celtic and bluegrass. He is an endorser of Hoehner harmonicas and those customized by Joe Filisko, and considers Howard Levy an important influence. On this second Stained Grass Window release, the group shows their outstanding musicianship in 15 varied tunes ranging from the very traditional bluegrass, to some fine new songs, to a Stephen Foster classic, to their amazing arrangement of the old Box Tops rock hit "The Letter." With three of the members trading the lead vocal spotlight on this CD, Stained Grass Window serves up a generous collection of the kind of music that epitomizes the healthy state of bluegrass in the late 1990s.